It seems fitting that The Decemberists should visit the Commonwealth on Victoria Day weekend – after all, the reign of that particular monarch has provided much grist for Colin Meloy and his merry band’s creative mill. 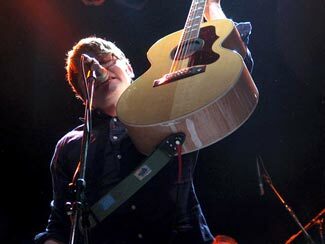 As much as I enjoy their recorded output, it’s the Decemberists’ live shows that really make their music for me. I was only a casual fan before I saw them make their Toronto debut at the Horseshoe last March. After that, I was one of the converted. Last night was their third time through town – I missed the last show at Lee’s Palace, which is where this one was supposed to be held before demand outstripped supply and it got moved to the larger Phoenix. Another change in plans was the opening act. Originally scheduled opener Willy Mason had to withdraw from the tour a few weeks ago due to health issues, so he was replaced by Rebecca Gates, ex of the Spinanes. I never listened to the Spinanes back in the 90s – I was aware of their presence on the musical landscape, but I never heard note one of them till recently, and even then only in passing. Last night was essentially my first exposure to her work. Performing solo on electric guitar (though she did later bring a number of Decemberists out to back her on a couple of songs), Gates offered up a set of mainly low-key, bluesy/soulful numbers interspersed with chatting with the crowd. Her talkativeness, she said, was a consequence of driving from date to date on this tour alone in her car and being generally starved for interaction. I was standing right up front so her soft, smoky vocals were hard to hear over the guitar, but what I did catch sounded quite good. My retroactive musical education will probably reach The Spinanes sooner or later, I’m sure. The Decemberists were once again splendid. Off the top of my head, I can’t think of a band that’s as much fun to see perform. Sporting temporary Canadian flag tattoos (they do love Canada), all six of them played with such joyous abandon, you couldn’t help but be caught up in it. Of course, when you’re performing songs with as unusual lyrical content as they do, irony really isn’t an option. It’s hard to pick highlights but besides the set and encore closers (more on those in a bit), “July! July!”, “The Bagman’s Gambit” and “Sixteen Military Wives” were real standouts for me. Meloy opened the encore in solo acoustic mode and actually acquiesed to an audience request for Morrissey’s “Every Day Is Like Sunday”. I’m a little curious about what he’d originally intended to play, but I can’t imagine it’d have gotten a better response than the Moz cover. You wouldn’t expect a band as verbose as the Decemberists to inspire many singalongs at their shows, but everyone in attendance – or at least around me – seemed intent on doing so and keeping up with Meloy, word for word. Or at least try. But that was actually fine as audience participation seemed to be the watchword for the evening. During main set closer “The Chimbley Sweep” (which also featured a “Hava Nagila” accordian breakdown and duelling guitars between Meloy and drummer John Moen), the entire audience found themselves crouched right down on the floor at Meloy’s urging. Why? I do not know, but he seemed to take great delight in it. Then during the encore, guitarist Chris Funk was in charge of making everyone scream as though they were being swallowed by a giant whale at the appropriate moment in “The Mariner’s Revenge Song”. Extraordinarily silly? Yes, but when show feels more like the final night at drama camp than a rock concert, it seems perfectly normal. Now while I would never say that former drummer Rachel Blumberg’s leaving the band was a positive thing, that saying about doors and windows is true. New drummer Moen adds some real muscle to the rhythm section and is more than an able replacement behind the kit. Most impressive, however, is the addition of Petra Haden on vocals and violin. A much stronger singer than Blumberg (though sometimes Blumberg’s creepy voice would more fitting to the songs), her backing/harmony vocals really compliment Meloy’s nasal bleating (meant in the most positive sense). Her taking lead vocals on the cover of Kate Bush’s “Wuthering Heights” was another highlight of the show for me and the violin is a great addition to the band’s already eclectic instrumentation. While she’s just a touring member for the time being, I say she’s a keeper and would be an invaluable permanent member. And I have a special note for whoever was in charge of the lighting last night – Mr Lighting Guy, your crazy backlighting technique was most unusual in that it felt at times like the audience was getting lit up more than the band, but it was incredibly effective for photos. Thank you very much. Next time you are in town I will buy you all-you-can-eat breakfast at The Golden Griddle. It’s hard to believe that of the four shows I’ve seen this past week, not one has been subpar. Each has been outstanding in its own way, and the Decemberists were a great finish to what’s been a really exhausting week of showgoing. But now I’m happy to have nothing really on my sched for a couple weeks. Look at the sidebar! It is so very short. I may have to take up a new hobby to occupy my time. 24/40 talks to another band championing the Kate Bush cover, The Futureheads. Britpop survivors Embrace will be at Lee’s Palace on July 26. Their latest, Out Of Nothing, came out in North America at the start of May. Royal City guitarist and Three Gut Records namesake Jim Guthrie finally has a website to call his own. And finally, these robot cats are goddamn creepy. I was there also, but made the misake of taking my usual place infront of the soundman, and had to endure a bunch of middle-aged drunks talk through out their set. But I still enjoyed it immensly. Mr. Meloy is sooo charasmatic, and I couldnt believe how strong his voice is live (it was my first time seeing them). Oh and great pictures too! Hopefully a recording of this will surface. Even if my friend and I missed Rebecca Gates, that show’ll probably go down as one of my fave’s of the year! As much as i enjoy a scrappy female who kinda looks like ryan adams playing the guitar, i could not get into her and i heard alot of good things so i was hoping too. She reminded me of mellisa ferrick but without the amazing guitar work. I kinda wish i was standing closer, as we had gotten there at door and could have had any spot. But, wow, they are alot of fun and even the songs i didn’t know were really great plus who breaks into hava na gila in the middle of a song? also the crowd was really great which always makes it more fun. Iv been hearing that he has been covering ‘ask’ so maybe that is what he intended, either way, a moz cover is a moz cover and he has the perfect voice to do it with. actually, embrace still isn’t due out till june 14th in america. kept getting pushed back..
i saw the decemberists for the first time in nashville last week. geez, i was totally blown away by their stage presence and zany antics. i wasn’t expecting all that. it’s a party on that stage. they tried that same trick with getting everyone to sit down too. the chris funk whale bit was a blast. oh, and i was reallyt reminded that it’s all about that voice. his voice really is that strong and piercing. did you pick up one of those Instant Live discs? I just heard the 5/5 show and the sound is incredible. They played "Ask" at the last Toronto show. The Spinanes RULE! They are right up your alley Frank. I would recommend (in order) Arches & Aisles, Manos and then Strand, but they are all great records. I heart Rebecca Gates.